The Yanmar Corporation was founded in 1912 and is based in Osaka, Japan. The Yanmar America Corporation is based in Adairsville, Georgia. 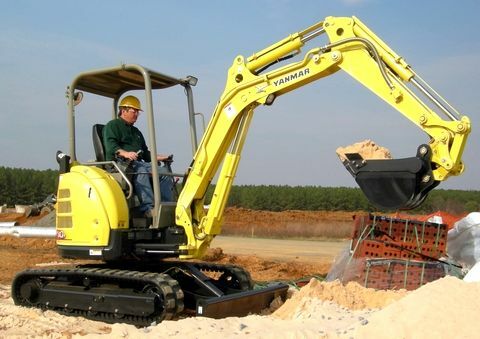 Yanmar was the first company to market a true zero-tail swing excavator. This means that there is no need for a counterbalance “tail” on the back of a compact excavator. This technology made it possible to use mini excavators in very confined spaces. Yanmar mini excavators are built on their tradition of fuel-efficient engines. 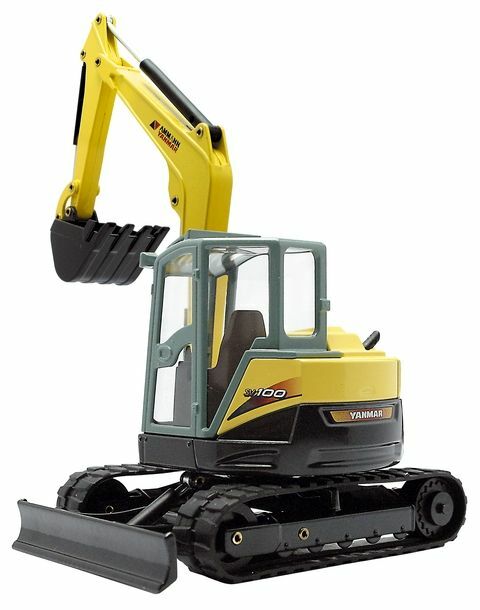 There are three main compact excavators manufactured by Yanmar: the ViO series, the SV series, and the B-Sigma. ViO mini excavators are a line of machines with a true zero tail swing. The line is in its fifth generation model. It can turn in the width of the machine and maintain stability. The weight of the seven models in the ViO series ranges from 3,704 pounds to 17,530 pounds. Horsepower in the ViO models ranges from 13.5 to 58.2. The ViO excavators can dig to depths ranging from 7 feet 7 inches to 15 feet and 5 inches. The smallest Yanmar mini excavator in the ViO line is the ViO17. With a housing that does not extend past the edges of the tracks it rides on, the ViO17 fits into very tight spaces. The undercarriage can contract and expand for the size of the space in which it needs to fit, yet the unit maintains stability. There are two models in the SV series, one is 2,348 pounds and the other is 20,950 pounds. The large model offers horsepower of 73.5 and a digging depth of 16 feet and 1 inch. The Yanmar mini excavator in the SV line gives a digging depth of 5 feet 4 inches and a horsepower of 10.3. The tracks can narrow to 2 feet 3 inches to fit through small passages. They can also lift and lower independently from one another to provide more stability on slopes. This model has an ultra tight turning radius. The B-Sigma has a very unique “Sigma” boom that extends straight up, above the cab of the machine. This creates not only a zero tail swing, but also no overhang in the front. Because of this technology, the B7Sigma-5A can turn completely in a 360 degree circle. No part of the cab extends past the tracks of the excavator. 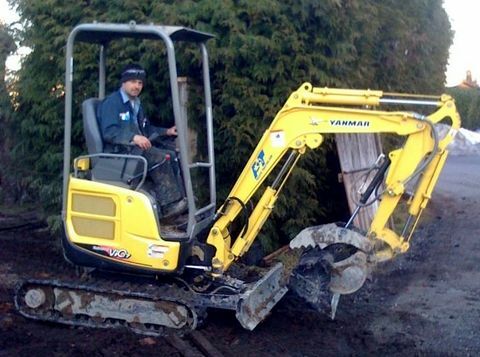 This Yanmar mini excavator is perfect for tight areas and ones where damage to the site needs to be avoided because of cables or pipes already in place.